The company will only make 7,000 pairs of the UltraBoost Uncaged Parley. Late last year, Adidas teamed up with Parley, an organization raising awareness against ocean pollution, to design a partially 3D-printed shoe made from up-cycled marine plastic. Then, in 2016, the two companies took that partnership one step further with the limited-edition Adidas x Parley, a running sneaker that also featured materials created from ocean waste. Ultimately, both of these concepts pave the way for what the sportswear giant is announcing today: the UltraBoost Uncaged Parley. Unlike the Adidas x Parley Silhouette, where 100 pairs were given away through an Instagram contest, this one you'll actually have a chance to buy when it goes on sale next month for $200. All told, Adidas is making 7,000 pairs of the UltraBoost Uncaged Parley, and the company says it plans to produce at least a million pairs using ocean plastic by the end of 2017. It's yet another sign of Adidas' willingness to take risks, especially with sustainability innovations and emerging technologies like 3D printing. This particular model is based on the UltraBoost Uncaged design, one of the brand's most popular running-meets-lifestyle shoes. The main difference here, however, is that the Parley version features a soft Primeknit upper built with 95 percent ocean plastic. Other parts, such the as shoelaces, heel cap, heel webbing and sock-liner, were also made from materials retrieved by Parley during coastal operations in the Maldives, according to Adidas. Meanwhile, the midsole is all Adidas' Boost technology. That's the same foamy material found on its Yeezys, NMD and UltraBoost, the flagship running sneaker. 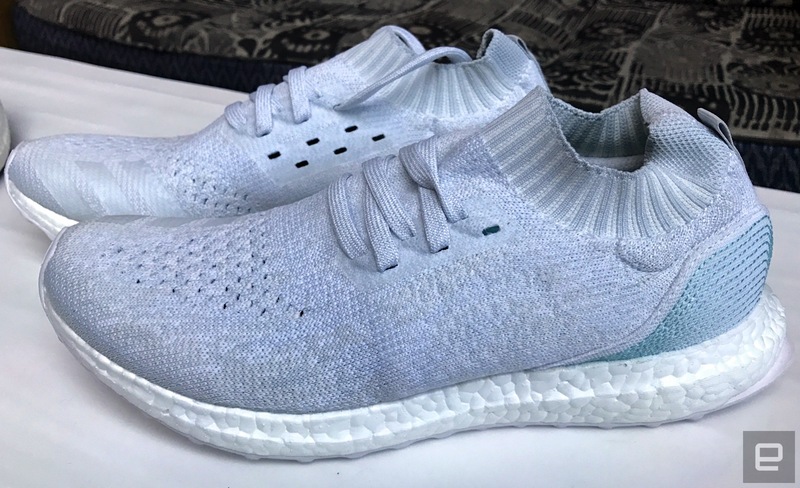 The company says it had to develop the Uncaged Parley without compromising on performance, adding that the key was to keep every signature element of a running shoe. In other words, if you happen to get lucky with a pair, wear it like you would any other. Don't let those yarn fibers stop you. The Adidas x Parley kits for Bayern Munich and Real Madrid. Now, the Uncaged Parley isn't the only product born out of this Adidas x Parley collaboration. Soccer clubs Bayern Munich (Germany) and Real Madrid (Spain) will debut environmental jerseys on November 5th and 26th, respectively. They're water-based prints and, similar to the UltraBoost Uncaged Parley, made from recycled ocean plastic. Adidas didn't say how limited these will be, but the price will be $100 each and they'll be available on November 4th for Bayern Munich and the 24th for Real Madrid. Those of you who purchase one will find an Adidas x Parley label with an NFC chip embedded, which will give you more information about the joint venture. Interestingly, team logos will be hardly visible on the shirts, a decision made by both clubs and sponsors to fall in line with Parley's commitment to the oceans and sustainability. Eric Liedtke, executive board member of Adidas Group, tells Engadget that the mission goes beyond what Adidas and Parley can do. Instead, it's an invitation to the entire fashion industry to join the sustainability movement. "We're inviting or challenging other people to get at the world's problems," he says. 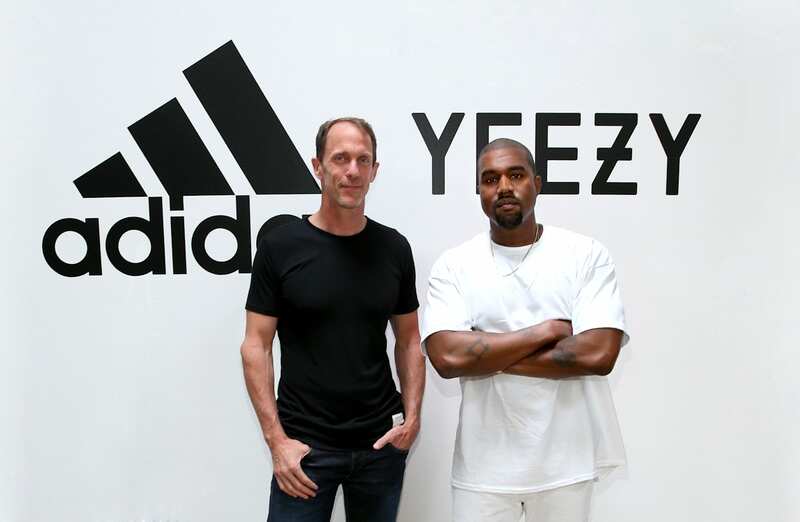 "We [Adidas and Parley] can't solve it alone." While Liedtke says Adidas won't be working with Nike anytime soon, if ever, Parley would definitely be open to it. And he's allowed to say that, since he's on Parley's Oceans Steering Committee. Eric Liedtke with Kanye West. "The industry should turn from being the problem to being the solution," says Parley founder Cyrill Gutsch. "We have to invent our way out of this situation, reinvent materials and the business." Gutsch, who I interviewed after he and Adidas enlisted 19 countries from the United Nations to help them combat ocean pollution, says we as a society have to understand how good at killing we are. He says it starts with finding alternatives to plastic, as well as other toxic materials, and making them usable in products we use every day. If anything, the up-cycled shoes and football jerseys prove you can have well-designed products that are also environmentally conscious. I had the chance to try on the UltraBoost Uncaged Parleys and, not surprisingly, they feel just as comfortable as the regular pair I own. They also happen to smell like the ocean, but maybe that is just my brain playing tricks on me. Ultimately, Gutsch says the industry needs to act fast before it's too late. "There's no Batman or Superman coming along," he says. "If we don't fix this now, we're fucked."